As you approach the Illinois State Capitol Building from the east, this towering bronze statue of Abraham Lincoln comes into view. Its creator, Andrew O'Connor, was born in Massachusetts in 1874 and studied sculpture under his father and Daniel Chester French, whose massive seated Lincoln dominates the Lincoln Memorial in Washington, D.C. 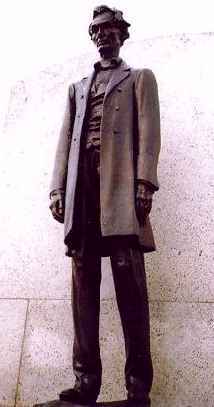 Presented to the city of Springfield in 1918, the statue symbolizes President-elect Lincoln in 1861 when he left his friends and neighbors before boarding a train for Washington, D.C. Behind the statue you can read the entire text of Lincoln's touching Farewell Address carved on the huge granite slab.